Happy Birthday, Mark! As with so many people who have lived in Texas, many of my sweet husband’s conversations sooner or later (usually sooner!) wind their way around to extolling the wonders of that state. I made this quilted wall-hanging for him in 2001. This was just about the first real quilt I made. I’d made heirloom sampler quilts, but they were really comforters, with very little quilting. And this was the first time I tried free-motion quilting! 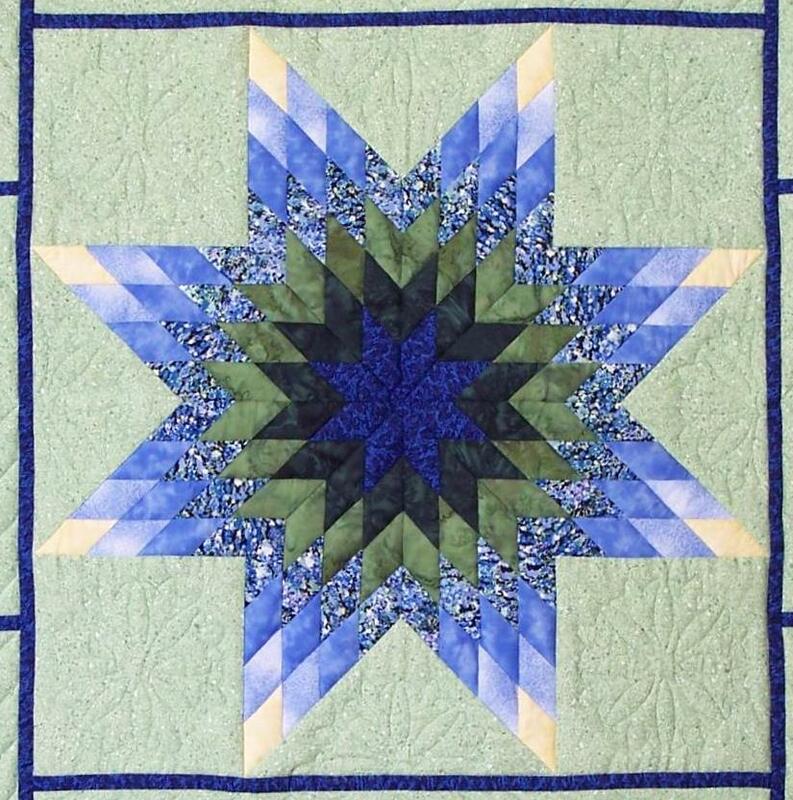 Everything about the quilt is “Texas-y.” The center star is a Lone Star, of course. 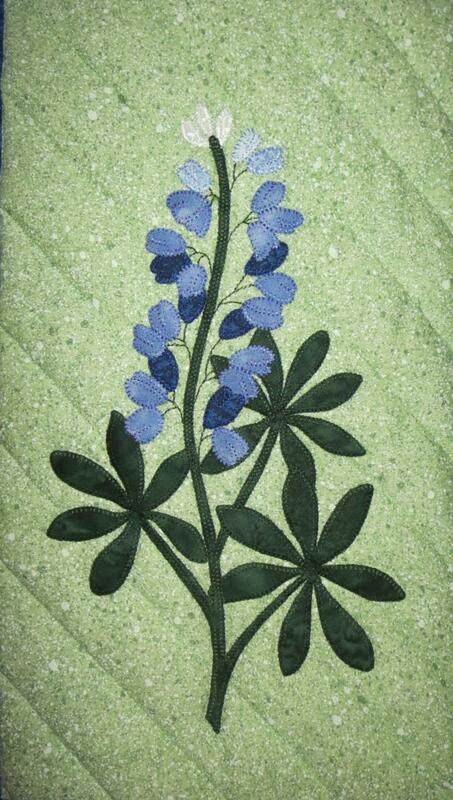 The fused, machine-appliqued bluebonnets are an adaptation of a design from Wildflower Album by Bea Oglesby, 2000, AQS. I stitched around all the applique with a tiny blanket stitch, and stitched the little stems with a straight stitch. Amazingly, I quilted in the ditch around all the applique with monofilament thread with the feed dogs up – not free-motion! Why? I was afraid of free motion! The yellow roses, inspired by a Husqvarna Viking machine embroidery design, were adapted for machine applique. The Celtic designs on the quilt are original, and reflect Mark’s Celtic ancestry. I quilted in the ditch around all the Celtic designs with the feed dogs up, too. I finally got my courage up and dropped those feed dogs and did a little free-motion tulip design in the large setting squares and triangles. 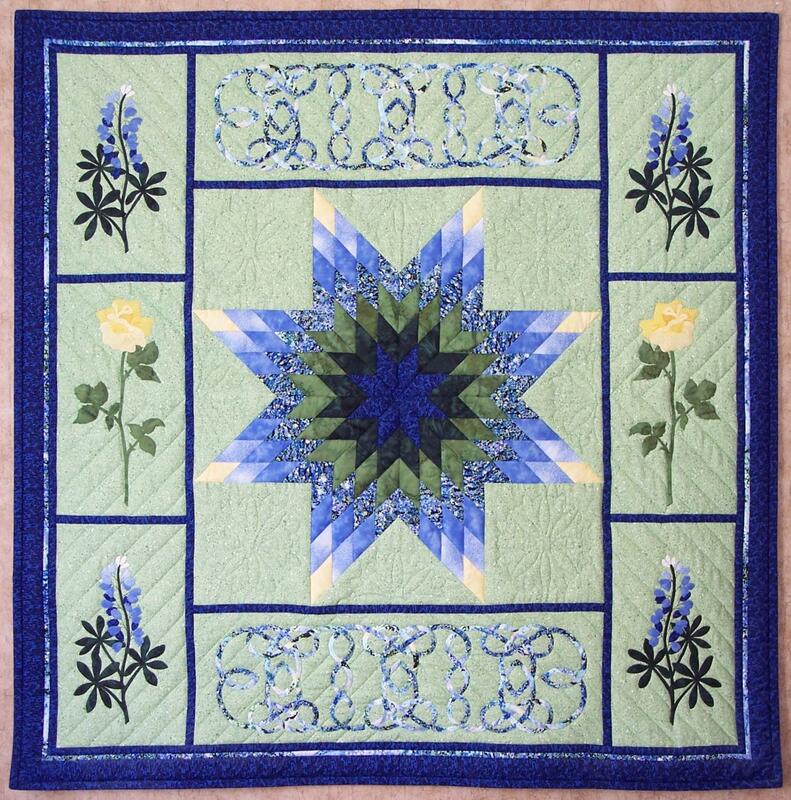 Sprinkled throughout the quilt, and used for the backing, is the Texas State Flower fabric by Northcott that was available then. I think the batting is poly. I’ve learned a lot about quilting since I made this. And I love My Texas Star even more! This entry was posted in Quilts and tagged Family, Quilts by susanstewartdesigns. Bookmark the permalink. Beautiful, a work of love. I’ve sometimes forgotten to drop the feed dogs and quilted entire bed quilts free motion with the feed dogs up. And sometimes if I am having tension problems I’ve found leaving them up can help. Your little quilt is beautiful as always. Happy birthday, Mark. Beautiful! Especially the Celtic design! Love it. Can’t believe it was your first quilt. You are so talented. Gorgeous. Wish I had one. Love all the things you make. It’s beautiful.